Beethoven, Ludwig van (1770-1827) Piano Sonata, Op. 27, No.2, "Moonlight", "Sonate Op. 27, Nr. 2 (Mondscheinsonate)". Heinrich Schenker. Universal: Vienna & New York, 1921. No. 36 of an edition of 50 on handmade paper. Oblong quarto. 36 facsimile pp. 6 pp. of sketches 6 pp. of commentary (in German) by Heinrich Schenker. New marbled boards with original label set in. Fine condition. 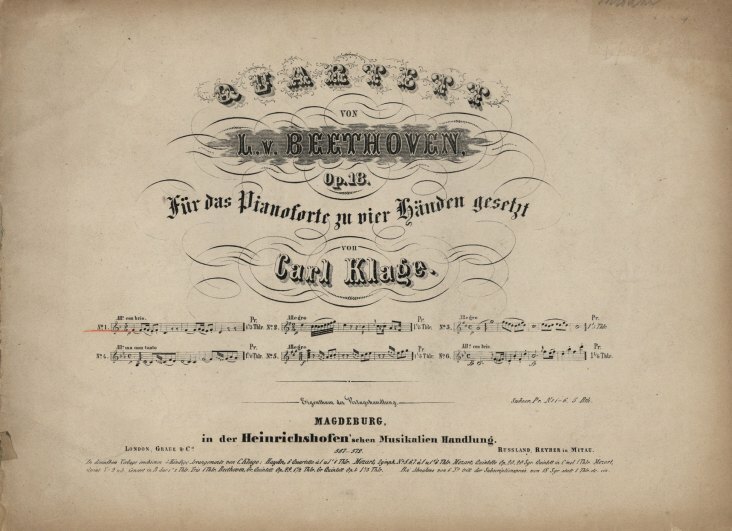 A nice copy of this very rare facsimile of the original manuscript which is now in the Beethoven-Haus in Bonn. Beethoven, Ludwig van (1770-1827) Piano Sonata, Op. 111, C Minor. Peters: Leipzig, c. 1952. Oblong quarto. Marbled boards. Corners quite bumped otherwise fine. Reprint of 1922 Drei Masken Verlag edition. 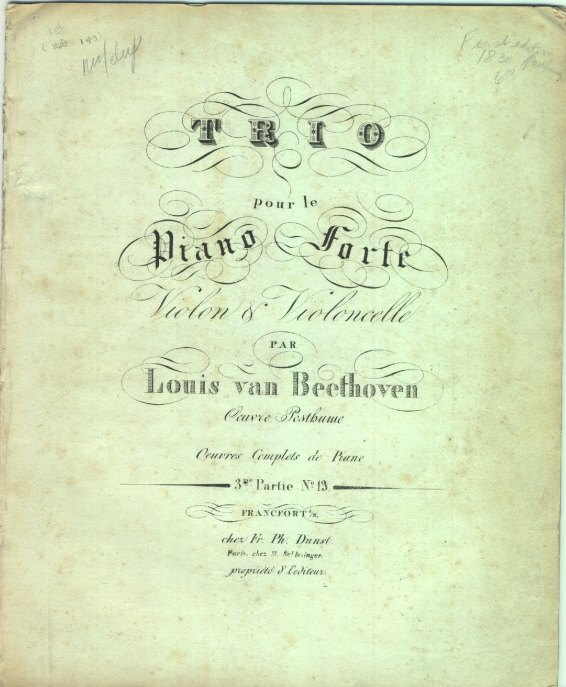 Beethoven, Ludwig van (1770-1827) Piano Trio, WoO. 38, Trio Pour Le Piano-Forte, Violon & Violoncelle, Oeuvre Posthume, Oeuvres Complets De Piano, 3me Partie, No. 13. Fr. Ph. Dunst: Frankfurt am Main, . PN 17. First Edition. Folio. 17 pp. Very slight foxing, a few pages with corners turned down, otherwise very good. Beethoven, Ludwig van (1770-1827) Septet, Op. 20, "Grand Septuor, Oeuvre 20, Partition". Bureau de Musique de C.F. Peters: Leipzig, . PN Plate 2254. Octavo. 92 pp. Needs rebinding, title page torn along edge, some pages brittle and ragged, otherwise good. Beethoven, Ludwig van (1770-1827) Septet, Op. 20, Arranged, Quintetto Pour 2 Violons, 2 Viols Et Violoncelle, Oeuv. 20 No. 1, No. 2. Bureau de Musique de C.F. Peters: Leipzig, [after 1814]. PN Plates 110, 111. Folio. 7/7 + 4/4 + 4/4 + 3/3 + 3/3 pp. Each part in modern heavy paper binding. Some foxing, otherwise very good with crisp musical text. Complete set of five parts. An early edition of the quintet version of the Septet. Kinsky p. 50 Übertragungen "c." Probably the same plates as the 1802 first edition in this arrangement. Beethoven, Ludwig van (1770-1827) Septet, Op. 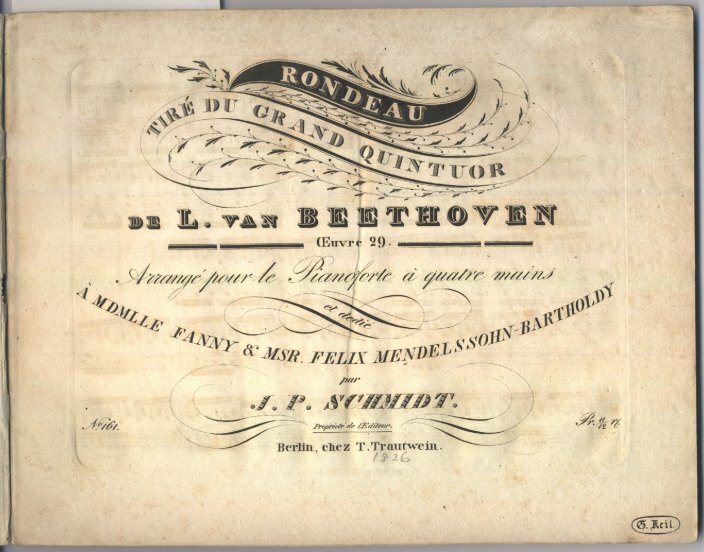 20, Grand Septuor De Louis Van Beethoven Arrangé Pour Le Pianoforte Seul Ou Avec Accompagnement D'une Flûte, Violon Et Violoncelle Par J.N. Hummel, Maitre De Chapelle à Weimar Et Chevalier De L'Ordre De La Légion D'honneur. Bureau de Musique de C.F. Peters: Leipzig, [by 1829]. PN 1983. First German edition of the Hummel arrangement. Folio. 31 pp. 19th-century heavy paper wrapper. Slight wear on corners, otherwise very good. Piano part only. 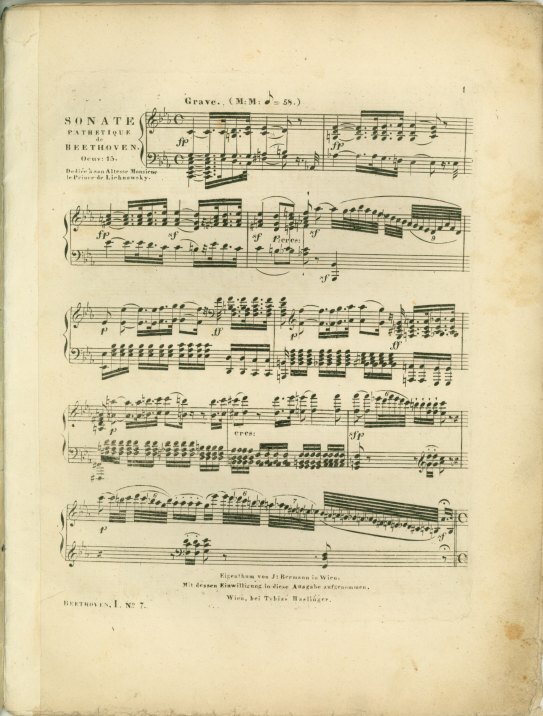 Kinsky p. 51, Nachdrücke "e."Attractively engraved title page with crisp musical text. Beethoven, Ludwig van (1770-1827) Septet, Op. 20, Septetto Pour Violon, Alto, Clarinette, Corno, Basson, Violoncelle Et Contre-Basse...dedié à Sa Majesté Marie Therese, L'Impératrice Romaine, Reine D'Hongrie Et De Bohème Etc,...oeuvre 20. Partie I, II. Bureau de Musique de C.F. Peters: Leipzig, . PN 108/109. First Edition, Titelauflage 2. Folio. 11/7 + 5/5 + 3/3 + 4/3 + 2/2 + 4/5 + 3/3 pp. Deep impression on bright, untrimmed paper. Complete set of seven parts. Plates are the same as the 1802 first edition of Kühnel, but with Peters title page.A superb copy in near mint condition. Beethoven, Ludwig van (1770-1827) Septet, Op. 20, Septetto Pour Violon, Alto, Clarinette, Corno, Basson, Violoncelle Et Contre-Basse...dedié à Sa Majesté Marie Therese, L'Impératrice Romaine, Reine D'Hongrie Et De Bohème Etc.,...oeuvre 20. Partie I, II. Bureau de Musique de C.F. Peters: Leipzig, . PN 108/109. First Edition, Titelauflage 2. Folio. 11/7 + 5/5 + 3/3 + 4/3 + 2/2 + 4/5 + 3/3 pp. Contemporary boards on first violin part, otherwise unbound. Very good. Complete set of seven parts. Plates are the same as the 1802 first edition of Kühnel, but with Peters title page. Beethoven, Ludwig van (1770-1827) Sonata For Violin & Piano, Op. 23, Sonate Pour Piano Forte Avec Un Violon Composeé Et Dediée à Mr. Le Comte Maurice De Fries...Oeuvre 23. Simrock: Bonn, . PN 226. Folio. 15 pp. Glazed linen boards. Spine with leather label. Fine condition. Piano part only. Issued shortly after the Oct. 1801 first edition. Title page also has an additional label for Breitkopf & Härtel, Leipzig. Beethoven, Ludwig van (1770-1827) Sonata For Violin & Piano, Op. 24, "Spring", Sonate Pour Le Piano-Forte Avec Violon Obligé, Oeuvre 24. Lischke: Berlin, . PN 1572. 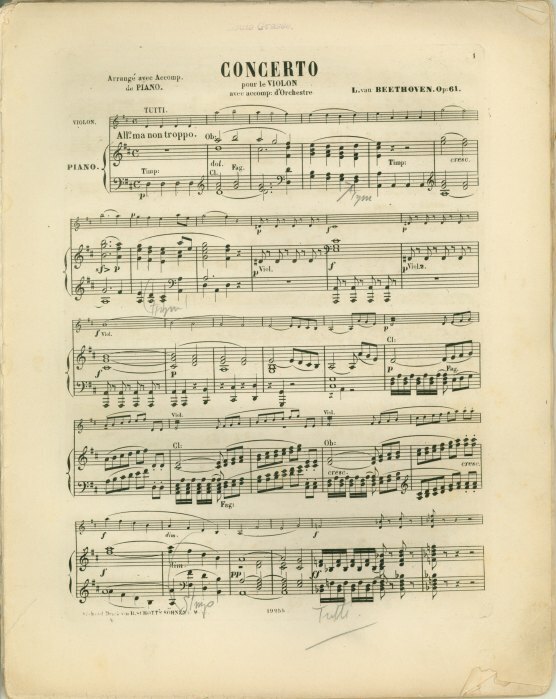 Piano, 17 pp. oblong, violin, 6 pp. folio. Contemporary blue boards. Spine needs replacement, light foxing on piano part, of which the first leaf is detached, unobtrusive glue stain on small repair to first leaf of violin part, otherwise very good. Separate piano and violin parts, both signed in ink by a past owner. Beethoven, Ludwig van (1770-1827) Sonatas For Violin & Piano, Op. 12, "Trois Sonates Pour Le Piano & Violon Dédiées à Salieri Par L. Van Beethoven. Oeuv. 12. Partition Et Parties Séparées". Schlesinger: Paris, . PN Plates 827, 838, 839. Folio. 73 pp. Disbound. Foxing throughout, but not obscuring any of the musical text, otherwise good. Piano part only. 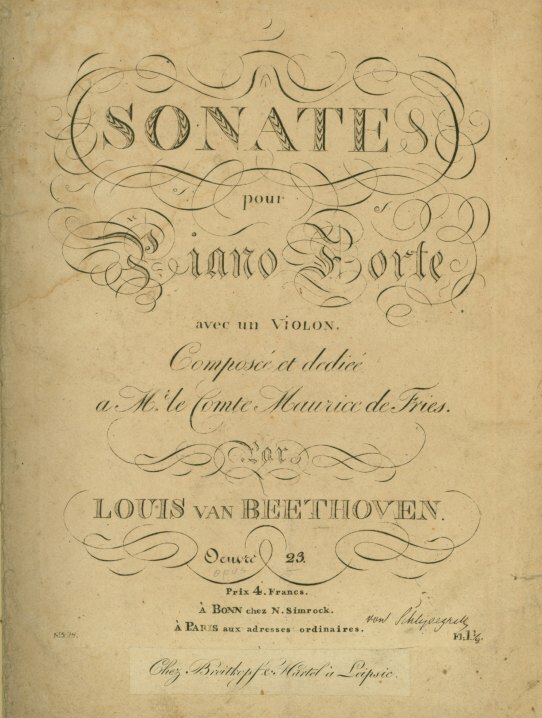 Separate title page for each sonata. Beethoven, Ludwig van (1770-1827) Sonate Für Das Piano-Forte, Op. 111. Tobias Haslinger: Vienna, 1823. PN "Beethoven I. No. 30". Early Edition. Quarto. 22 pp. One page taped from thumbing, otherwise a very nice copy. Cover spotted and slightly soiled. 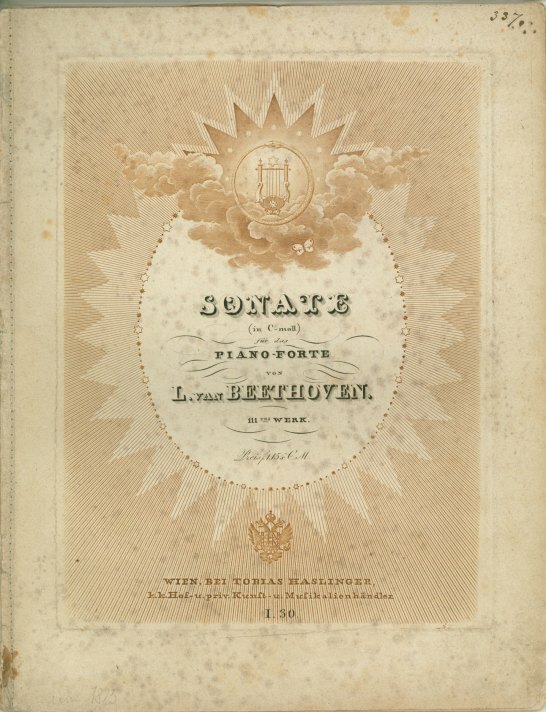 Beethoven, Ludwig van (1770-1827) Sonate Pathetique, Opus 13. Tobias Haslinger: Vienna, 1828. PN "Beethoven, 1. No. 7.". Early Edition. Folio. 17 pp. Early blue paper covers. Clean deep impression. Very slight stains on a couple of pages, but overall nice copy. One page trimmed. Missing title page, but has an autographed replacement. 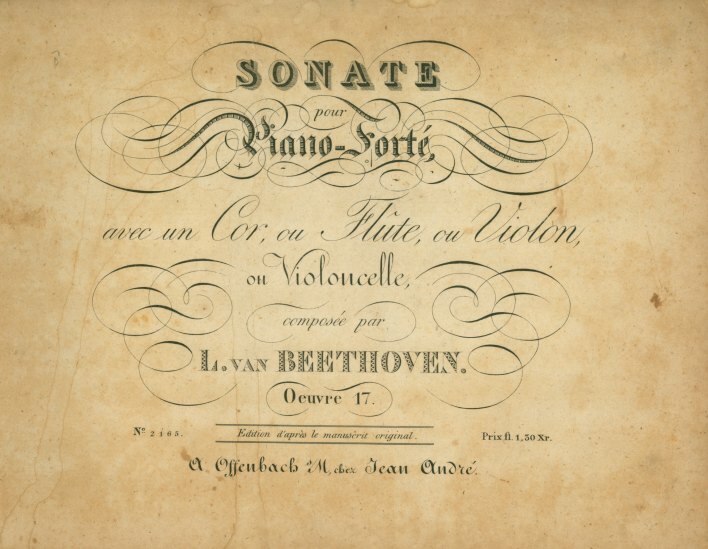 Beethoven, Ludwig van (1770-1827) Sonate Pour Piano-Forte, Avec Un Cor, Ou Flute, Ou Violon Op. 17. André: Offenbach am Main. PN 2165. Early Edition. 11 pp. In contemporary thin paper wraps; back torn. Title page and interior somewhat stained and soiled. Beethoven, Ludwig van (1770-1827) String Quartet, Op. 95, Beethoven Onzième Quatuor Pour Deux Violons, Alto Et Basse, Oeuvre 95. Janet et Cotelle: Paris, [c. 1829]. PN Plate 2061JC. Folio. 8 + 8 + 8 + 8 pp. Disbound. First two pages of first violin part detached. Minor water stain on first violin title page. Some markings, some foxing, otherwise good. Complete set of four parts, each with title page. Beethoven, Ludwig van (1770-1827) String Quartet, Op. 132, Quatuor Pour 2 Violons...Composé & Dédié à Son. Altesse Monseigneur Le Prince Nicolas De Galitzin Lieutenant Colonel De La Garde De La Majesté Imperiale De Toutes Les Russies...Oeuvre Posthume. Oeuv 132. Schlesinger: Berlin, . PN Plate 1443. First Edition. Folio. 19 + 15 + 15 + 15 pp. Leaves of outer folio of violin 1 detached; light water staining along inner binding of violin II and viola, leaving musical text unobscured; some performance marks, otherwise very good. Complete set of parts. 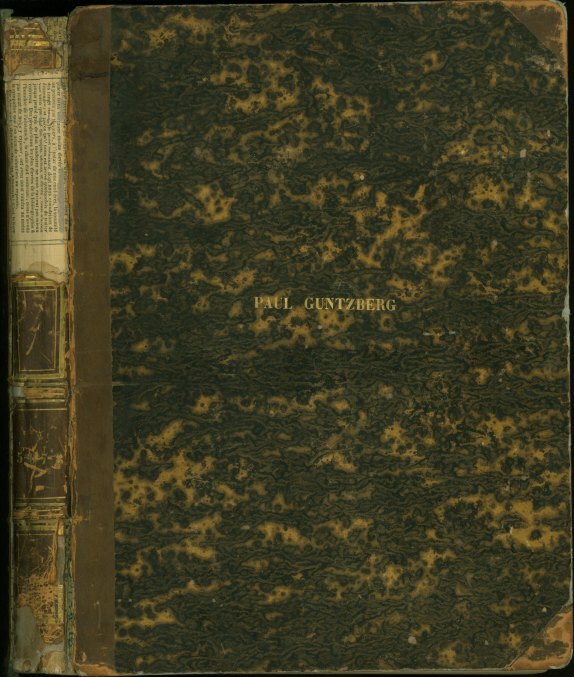 One of the earliest issues of the first edition, with title page on first violin only. Beethoven, Ludwig van (1770-1827) String Quartet, Op. 133, Grosse Fuga, Quatorzième Quatuor Grande Fugue Tanton Libre Tanton Recherchée Pour 2 Violons...Dédiée à Son. Altesse Imperiale & Royale Eminentissimi Monseigneur Le Cardinal Rodolph Archiduc Di Autriche...Oeuvre 133. Schlesinger: Paris, . PN Plate: M.S. Folio. 8 + 8 + 8 + 8 pp. Disbound. Some foxing, otherwise very good. Complete set of parts. A very early edition published in Paris within days of the Viennese first edition. Beethoven, Ludwig van (1770-1827) String Quartet, Op. 135, Arr., Quatuor, Oeuv. 135. (Oeuvre Posthume) De L. Van Beeethoven Arrangé Pour Le Pianoforte à Quatre Mains Par A.B. Marx. Schlesinger: Berlin, . PN Plate 1494. First Edition in this arrangement. Oblong folio. 29 pp. Disbound. Title page with some bleedthrough, some foxing and bleedthrough throughout, margins heavily trimmed for binding but with no loss of musical text, otherwise very good. Title page stamped "Bibliotheca Landisbergiana." Beethoven, Ludwig van (1770-1827) String Quartet, Op. 18, No. 1, Arranged, "Quartett, Op. 18 Für Das Pianoforte Zu Vier Hände Gesetzt Von Carl Klage". Heinrichshofen: Magdeburg, [c. 1840s]. PN W.H.567. Oblong. 33 pp. Disbound. Some browning around corners of title page, otherwise very good. Beethoven, Ludwig van (1770-1827) String Quartet, Op. 18, No. 6, Arranged, Rondo Du Quatuor, Oeuvre 18, No. 6 De L. Van Beethoven, Arrangé Pour Pianoforté à Quatre Mains Par P. Horr. André: Offenbach am Main, [1828-29]. PN 5199. Oblong folio. 11 pp. Disbound. Some minor foxing in margins, title page foxed and wrinkled from binding, otherwise very good. Title page stamped "Biblioteca Landsbergiana". Beethoven, Ludwig van (1770-1827) String Quartet, Op. 59, No. 1, Arranged, Grand Quatuor De Violon Composé Et Arrangé Pour Le Piano Forte à Quatre Mains Par L.v. Beethoven, Op. 59, No. I. Smith, Elder, & Co: Bonn, . PN Plate 2119. First Edition in this arrangement. Oblong folio. 39 pp. Disbound. Some bleedthrough and offprinting, otherwise very good. Title page stamped "Biblioteca Landsbergiana." Arrangement by C.D. Stegman (Kinsky 142). Beethoven, Ludwig van (1770-1827) String Quartet, Op. 59, No. 2, Arranged, Grand Quatuor De Violon Composé Et Arrangé Pour Le Piano Forte à Quatre Mains Par L.v. Beethoven, Op. 59, No. II. Simrock: Bonn, . PN Plate 2417 (2119 on TP). First Edition of this arrangement. Oblong folio. 33 pp. Disbound. A few marginal colored pencil markings on cover, otherwise very good. Arrangement by C.D. Stegman (Kinsky, 142). Beethoven, Ludwig van (1770-1827) String Quartet, Op. 59, No. 3, Arranged, Grand Quatuor De Violon Composé Et Arrangé Pour Le Piano Forte à Quatre Mains Par L.v. Beethoven, Op. 59, No. III. Simrock: Bonn, . PN Plate 2243 (2119 on TP). First Edition of this arrangement. Oblong folio. 35 pp. Disbound. Untrimmed edges tattered, some soiling in margins of title page, internally very good. Beethoven, Ludwig van (1770-1827) String Quartet, Op. 95, Arranged, Quatuor Pour Deux Violons, Alto & Violoncelle Composé Part L. Van Beethoven Arrangé Pour Le Piano Forte à Quatre Mains Par Xav. Gleichauf, Op. 95. Simrock: Bonn, . PN Plate 2709. First Edition in this arrangement. Oblong folio. 21 pp. Disbound. Title page slightly wrinkled from binding, occasional minor foxing, otherwise very good. Beethoven, Ludwig van (1770-1827) String Quartets, Op. 18, Nos. 4-6, Three Quartets For Two Violins, Tenor And Violoncello, Op. 18, Book 2. Clementi, Banger, Hyde, Collard & Davis: London, [1805?]. PN Beethoven's Quartett's Op. 18 Book 2. Folio. 19 + 19 + 19 + 19 pp. Final two leaves of viola part detached, otherwise very good. Complete set of four parts, each with title page. Early editions of this opus are seldom available for sale. Beethoven, Ludwig van (1770-1827) String Quintet, Op. 4, "Grand Quintette Pour Deux Violons, Deux Altos & Violoncelle, No. 1". Simrock: Bonn, . PN Plate 543. Second edition. Folio. 11 + 7 + 6 + 6 + 6 pp. Disbound. Lower right corner of title page clipped out, not affecting text. Extensive performance markings in parts, some in crayon, otherwise good. Complete set of five parts. Beethoven, Ludwig van (1770-1827) String Quintet, Op. 29 , Arranged, Rondeau, Tiré Du Grand Quintuor, Oeuvre 29, Arrangé Pour Le Pianoforte à Quatre Mains Et Dedié à Mdmlle Fanny & Msr. Felix Mendelssohn-Bartholdy Par J.P. Schmidt. Trautwein: Berlin, . PN Publisher's no. 161. Oblong folio. 21 pp. Disbound. A little rumpled, slight foxing, otherwise a crisp, dark impression in very good conditon. Beethoven, Ludwig van (1770-1827) String Trios, Op. 3 & Op. 9, "1tes Terzett (in Es.) Für Violine, Viola Und Violoncello, 3tes Werk" And "2tes[-4tes], Terzett (in G) [D, C-moll], Für Violine, Viola Und Violoncello, 9tes Werk, No. 1[-3]". Tobias Haslinger: Vienna, [c. 1830s]. PN Plate: Beethoven X. No. 1 [2, 3, 4]. T.H. Folio. 15/11/9/9 + 13/8/8/8 + 12/8/8/7 pp. Disbound. Complete set of three parts for four trios. Attractive title page in black ink on red background on each trio's violin part. Beethoven, Ludwig van (1770-1827) Symphonies 1-4 In Full Score, "Collection Des Symphonies De Beethoven Un Grand Partition.". Richault: Paris, ca. 1830. PN "A.F. 321-324". Early Edition. Quarto. 252 pp. Half leather with marble boards. Some bleed through and light browning throughout, but overall internally a nice copy. Spine in poor condition. Both covers loose and rubbed. Spine heavily chipped with missing sections. Beethoven, Ludwig van (1770-1827) Symphony No. 1, Op. 21, Arranged, Ire. Symphonie Pour Le Pianoforte à Quatre Mains Arrangée Par Charles Zulehner Composé Par L. Van Beethoven. C.F. Peters (Bureau de Musique): Leipzig, [c. 1814]. PN 1033. First Edition in this arrangement. Oblong folio. 31 pp. Disbound. Left margin of title page repaired, with some foxing, moderate foxing on a few scattered pages, last leaf wrinkled from binding, otherwise very good. Beethoven, Ludwig van (1770-1827) Symphony No. 5, Op. 67, C Minor, "Fünfte Symphonie". Georg Schünemann. Maximilian-Verlag Max Staercke: Berlin, 1942. Limited edition of 400. Oblong folio. 306 facsimile pp. on laid paper + 44 pp. of commentary. Decorative paper boards. Spine sunned, otherwise fine. A nice copy of this rare facsimile printed during World War II. Beethoven, Ludwig van (1770-1827) Symphony No. 6, Op. 68, Arranged, Sixième Grande Sinfonie, La Pastorale, En Fa Majeur (F Dur) Composé Par Louis Van Beethoven Op. 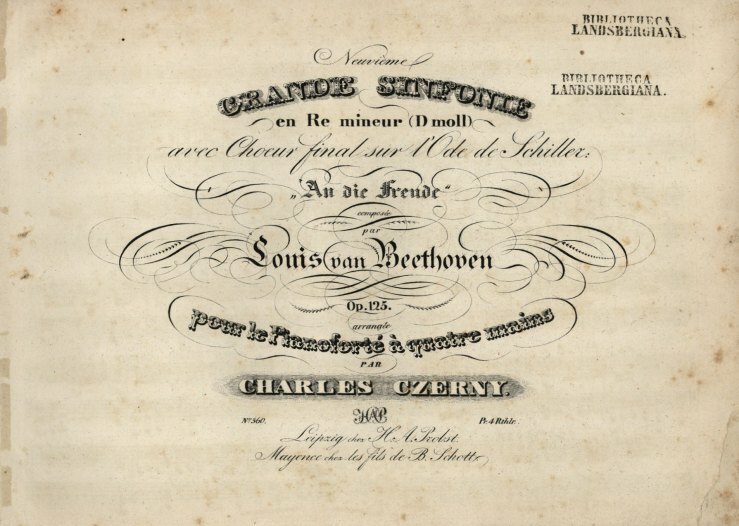 68, Arrangée Pour Le Pianoforté à Quatre Mains Par Charles Czerny. H.A. Probst: Leipzig, . PN Plate 357. Oblong folio. 49 pp. Disbound. Foxing on title page and moderate foxing throughout, otherwise very good. Beethoven, Ludwig van (1770-1827) Symphony No. 9, Op. 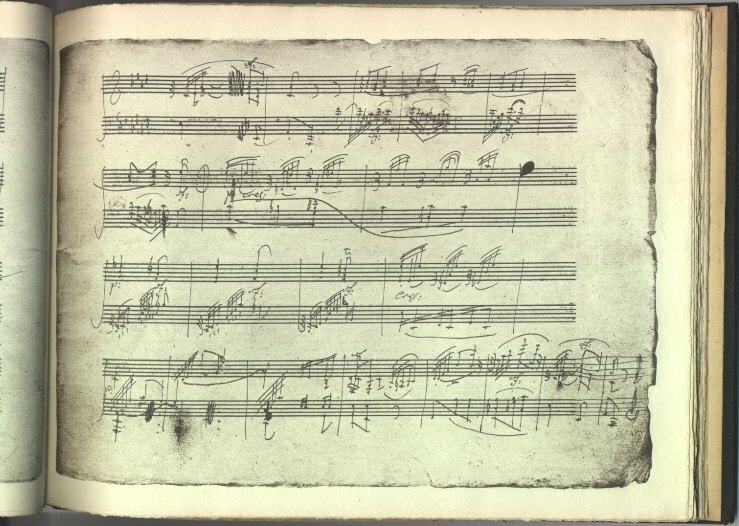 125 ("Choral"), Symphonie Nr. 9 D-Moll, Op. 125. Peters: Leipzig, 1975. Oblong folio. 404 facsimile pp. Beige linen boards. As new except wrapper slightly frayed. A reprint of the rare Leipzig 1924 facsimile, with the addition of the coda of the scherzo which was not available to the Kistner & Siegel in 1924. Beethoven, Ludwig van (1770-1827) Symphony No. 9, Op. 125, Arranged, Neuvième Grande Sinfonie En Re Mineur (D Moll) Avec Choeur Final Sur L'Ode De Schiller: 'An Die Freude' Composé Par Louis Van Beethoven Op. 125. Arrangée Pour Le Pianoforté à Quatre Mains Par Charles Czerny. H. A. Probst: Leipzig, . PN Plate 360. First Edition in this arrangement. Oblong folio. 49 pp. Disbound. Title page lightly foxed with small portion of bottom corner torn off (not musical text on verso), moderate to heavy foxing on some pages, otherwise very good. Beethoven, Ludwig van (1770-1827) Violin Concerto, Op. 61, Arranged, Concerto Pour Le Violon Avec Accomp: D'Orchestre, Arrangé Avac Accomp. De Piano. B. Schott's Söhne: Mainz, 1867. PN 19255. Late edition. Folio. 39 pp. Some edges tattered, thumbed on corners, and occasional bleed through. Overall nice. No title page. Some pages detached. Pencil annotations through first movement.